For the buyers of these first Ryzen processors, this is ultimately a nice subsequent confirmation to have set the right horse. In the future, however, such high growth rates are hardly to be expected, since now the majority of the Zen optimizations are already appropriate and possibly still coming Zen optimizations are likely to be too few in number to be able to hit the same high level. At the same time, the Zen architecture is already being considered in software development, which means that in the future it will certainly be possible to see the same performance picture on the launch day of new processors, which will be reflected in later tests. Smaller differences in the range of just over one percentage point are always in it, but equal to + 6% higher performance through subsequent optimization on top of it, is really only conceivable for fundamentally new architectures (like AMD's Zen). So much for quad cores dropping of the cliff for gaming. Very little change and still ahead. 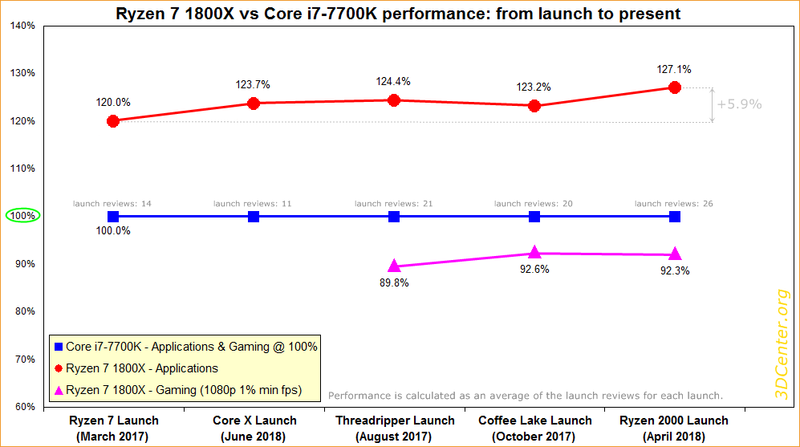 Not sure why first gen Ryzen buyers would need their purchase 'validated' - those that bought one did so knowing it provided much better MT performance than the 7700K despite being a bit slower at gaming. A few % here and there doesn't really change that. Shiny new MacBook, i7 8850H, where is the Coffee Lake love? For the Intel fan that has 'everything'... Intel... Playing Cards?